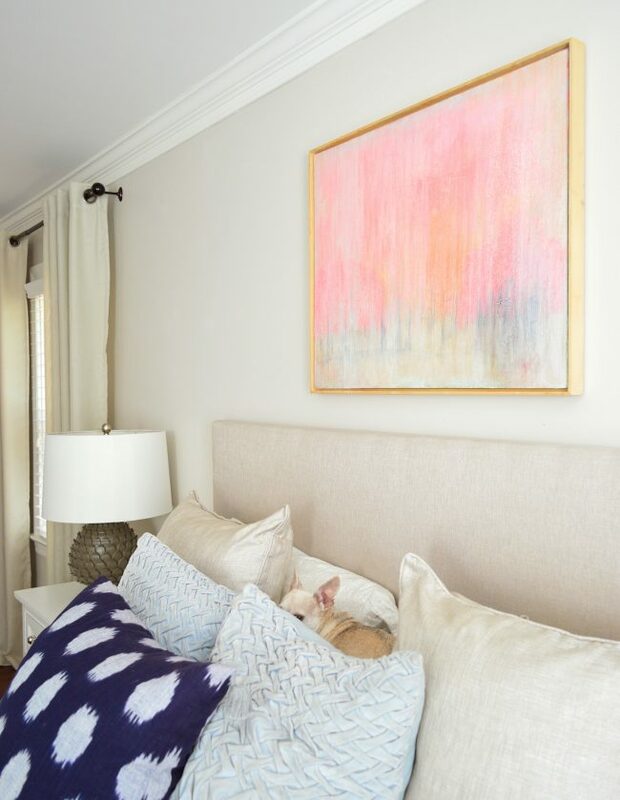 We mentioned some recent master bedroom movin’ & shakin’ on this week’s podcast, so we thought a post full of photos was in order for anyone wondering how it’s looking these days. Pretty much everything in our bedroom was purchased while we were living in our second house, so after moving here in 2013 stuff just kinda landed where it landed and whoop, there it was. We painted. We hung frames. 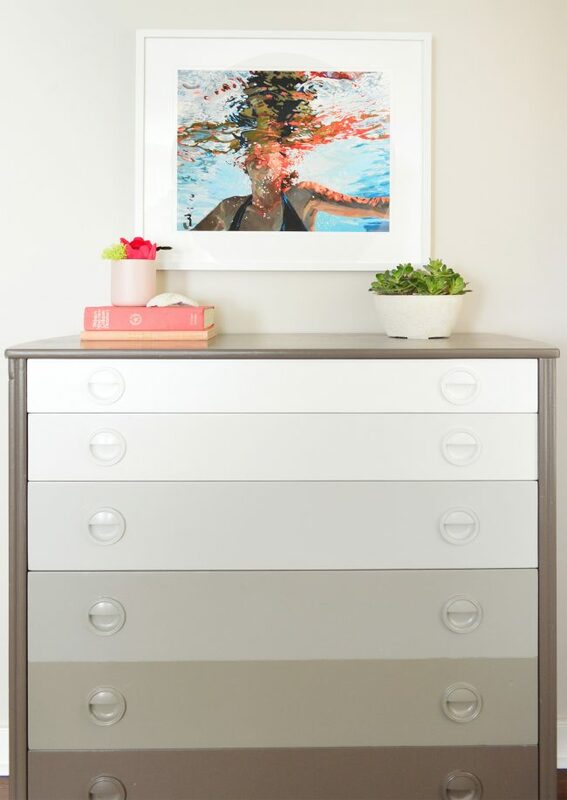 We made a few sporadic dresser swaps, and then we repainted. But the anchor pieces like the rug, the bed, the armchair, and most of the other furnishings pretty much remained the same. More recently we got a super on-sale chandelier and swapped beds with the guest room and it felt like the room was nicely settling into feeling “nearly-done.” Basically, we were fully expecting to go back to ignoring this corner of the house for at least a few more years. And then it happened. A total bedroom curveball. 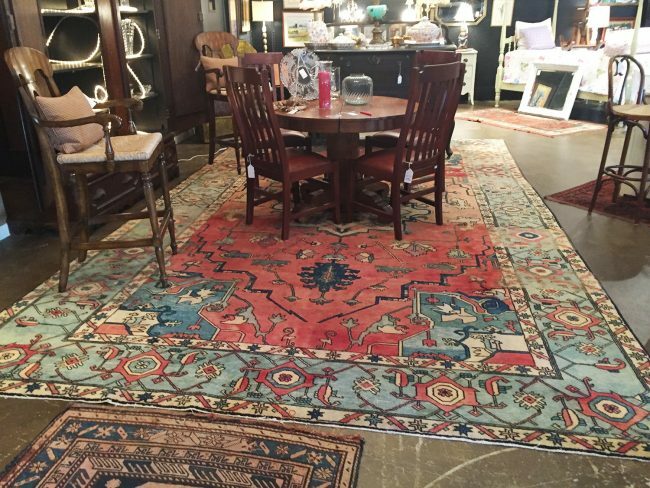 My friend texted me a gorgeous picture of a rug she came across in a local consignment shop called Izzie’s. YES, A CONSIGNMENT SHOP. And I fell hard. It hit me like a ton of bricks. Rug love at first sight. 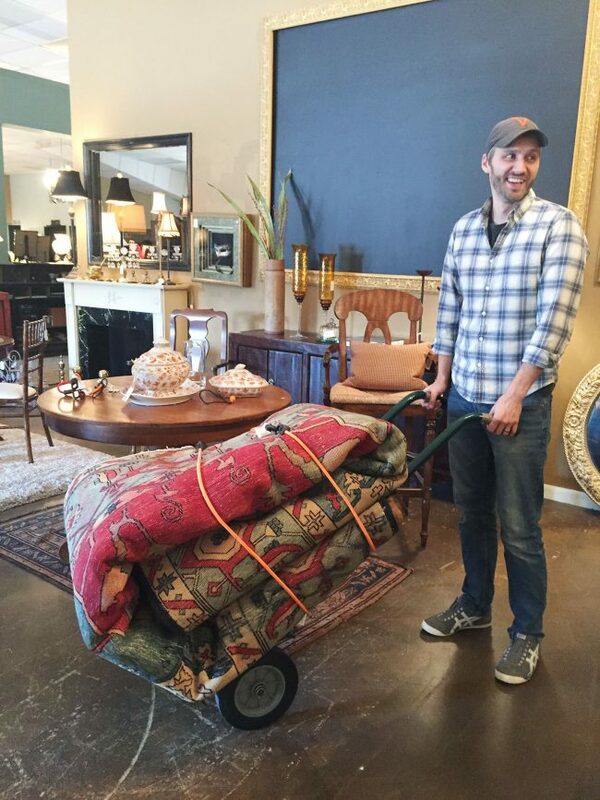 I’m pretty sure you could have seen little cartoon angels flying around my head holding bow and arrows when I ran up to John with that dazed-looking cheeks-flushed expression and said “remember how we’ve always said it would be nice to have a plush wool rug in the bedroom someday! ?” And thankfully, he remembered. And he agreed that it looked promising enough to go check it out in person (and smell it, because John was wondering how a consigned rug might smell). 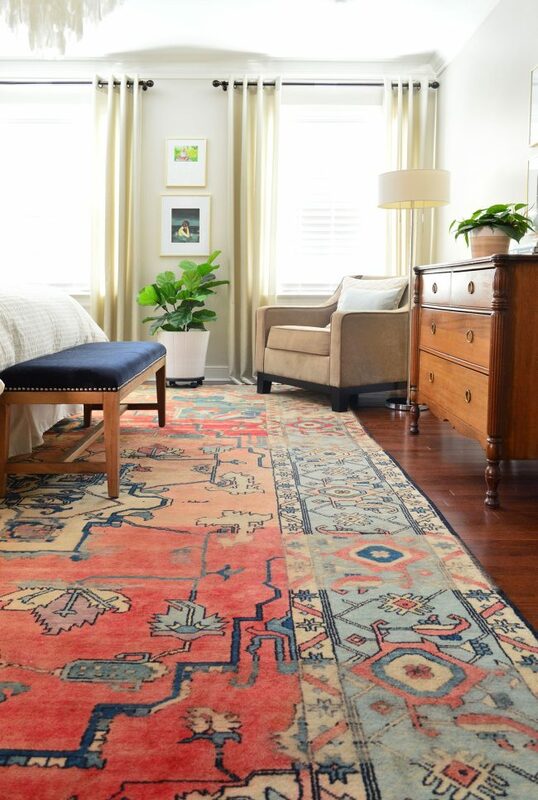 We love a flat weave rug – and have a bunch in our house – but ever since we discovered our love of plush wool Turkish rugs, we’ve been talking about how if ever there were a spot to add one more, it’s the master bedroom. It just feels like the ultimate place for something thick and cozy underfoot. 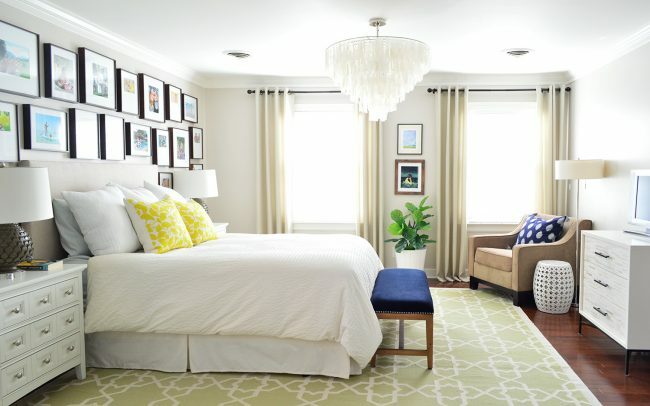 Plus, that soft green flat weave was something we bought back in 2011 for our last house’s living room, so the size wasn’t perfect for the bedroom (it wasn’t as long as the space, so it didn’t extend quite as close to the closet/bathroom door as we’d prefer). But it couldn’t have been that bad because we lived with it for nearly four years this way. Back to the new rug. It was miraculously the perfect size (around 12 x 16′) and didn’t smell at all (hallelujah!). And because it was a one-of-a-kind find at a consignment store, we knew it wasn’t going to wait around for us. Cut to John standing there grinning with it on the dolly, ready to be loaded into our car. And guess who muscled that giant wool beast up the stairs? That’s right. This married couple (*points to selves with thumbs*). Once we got it into the room I pretty much did the Macarena with excitement. It might just be my favorite rug of all time. I mean LOOK AT THE DETAILS! The COLORS! The SHAPES! The SHEER AMOUNT OF CAPS LOCK I’M USING TO DESCRIBE IT! 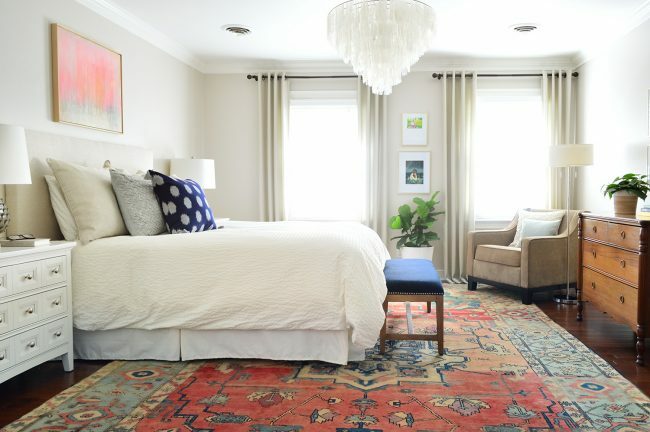 There are tons of other rugs I love a whooooole lot in this house (I’m looking at you dining room, bonus room, and living room), but this new bedroom edition just feels extra special. So shh, don’t tell them. And don’t cry for the old rug Argentina! That green flat weave sold in less than an hour on a local buy-sell board on Facebook and is currently living her best life in a neighbor’s house. You may also be noticing a couple of other changes in the wide shot – namely the wall behind the bed. 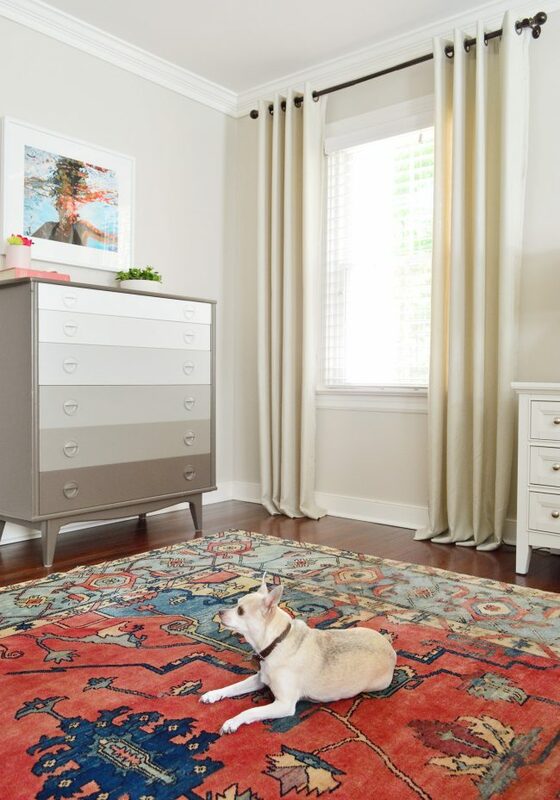 This rug’s bolder, more colorful, and larger scale pattern made it much more of a focal point than its soft green predecessor. So when we rolled out the new rug, the frames on the wall felt kinda jumbled and crazy all of a sudden. Like Lady GaGa in a meat dress next to Bjork in a swan costume. Why? 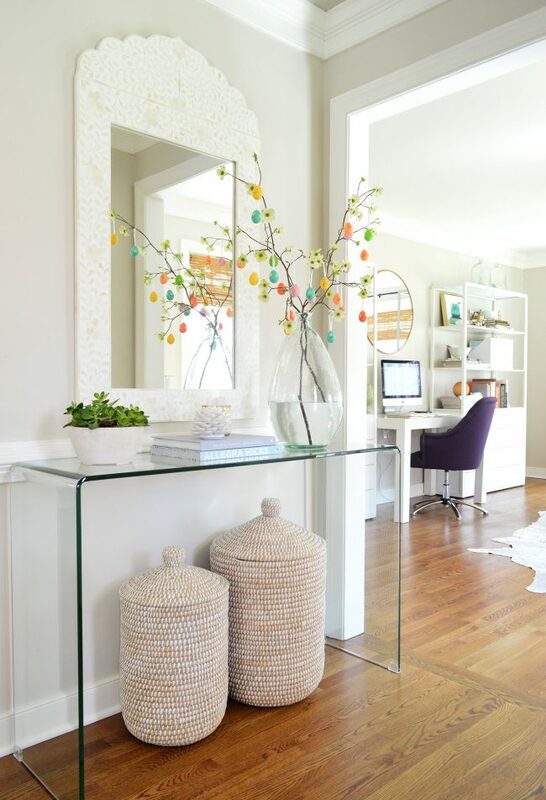 Because the frame wall used to be the focal point with a more subtle rug playing backup. But with a big bold rug in the room now, two focal points were fighting for attention. So we took all of the frames off the wall and tried out a few “calmer” pieces instead. After buying something the instinct might be to go buy a ton of other stuff to go with the exciting new item, but one of my favorite things to do instead is just to play around with what you have. 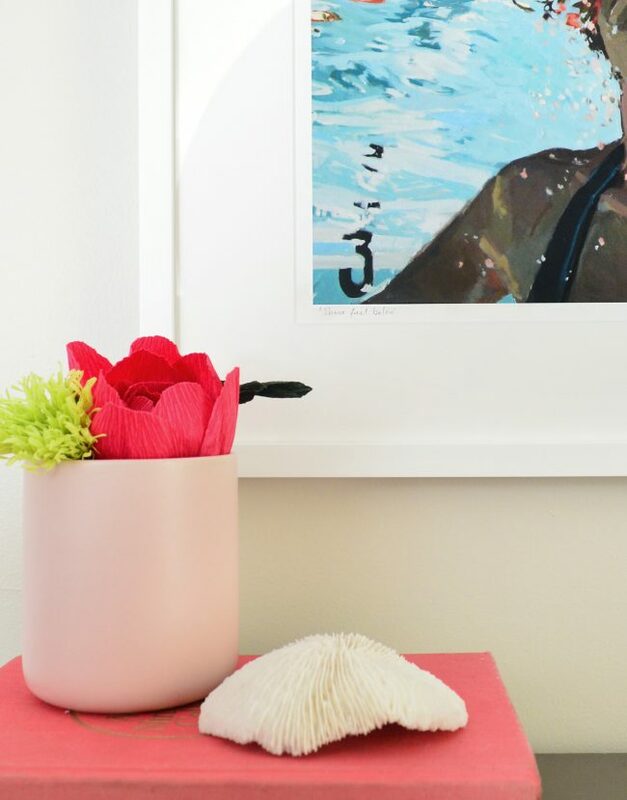 Sometimes you just have to shift a few things around the house and a few rooms end up looking and feeling fresher to the tune of zero more dollars spent. The winner was this painting that used to hang above John’s desk in the office (we bought it right off of the wall at a ski house we rented a few years back). I may stain the frame to match some of the other woods in the room, but for now it’s doing the job of complementing – not competing with – the new rug. And from afar it looks surprisingly similar to some of the gold frames we added to the other side of the room (more on those in a sec). And now in the office there’s a mirror we already had hanging where the pink painting used to be – which is nice because it reflects the light from the two windows across from it. There’s no better feeling than running up and down the stairs with things and trying them in other rooms until the crazy puzzle of “I need one thing for this room and another thing for that room” is solved. I’m serious. I LOVE that weird challenge feeling. It’s like Supermarket Sweep, Home Edition. Come to think of it, that would make a pretty good game show. Stop laughing. I’m serious. And I know you were worried about where all of our family photos went (JK, nobody cares about family photos unless they’re their own family). We found a few other places around the room to hang some, and I moved some into the guest room above my sewing desk. It’s not as many as we used to have on display, but I think we’ll survive just fine without having 20+ photos of ourselves in a single room anymore. 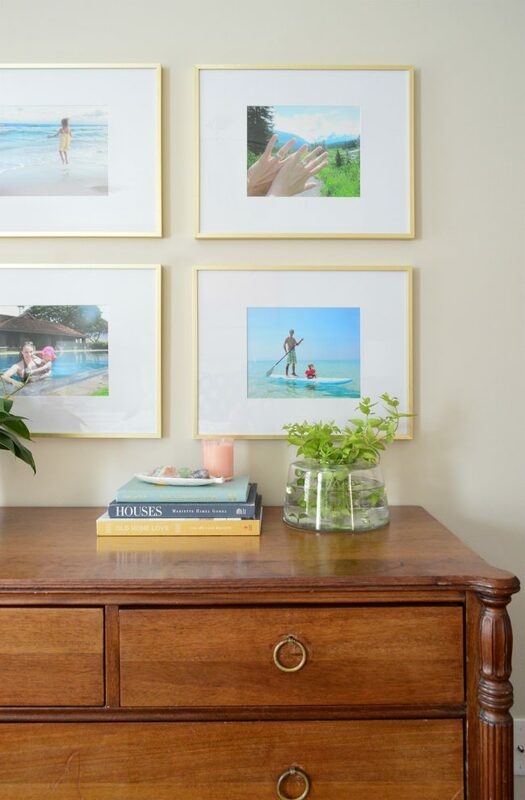 I reframed the photos in our room in these gold frames that I already had stashed in the guest room (they’re my favorite gold ones from Target that I’ve also hoarded for the beach house). They created a nice little grid above our wood dresser – an antique hand-me-down from John’s parents that had been in the closet. We just swapped it for the white dresser that used to sit here since the wood one looks so nice with the rich new rug colors. In rearranging our family photos, we realized we’re waaaay overdue for printing some updated ones (so many of a tiny baby boy and a toddler girl) so we sent a few new 8 x 10″ pics to Target so we can finally update these frames. 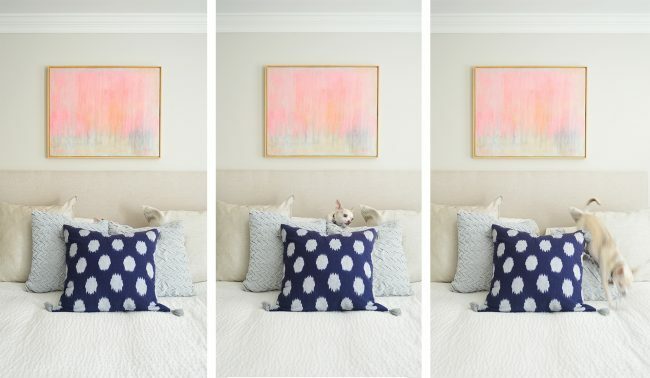 It just feels like you “notice” pictures again when you change them out, so this bedroom update was a nice kick in the pants to get on that. The other side of the room still has the gradient dresser we painted back in 2011 for our first book (yes, we have no shortage of dressers in here!). Also, can you tell John is asking Burger why he’s always walking into our pictures like he owns the place? You saw him up in the bed squishing all of our pillows a few pictures up too, right? Dude, is ALWAYS ready for his close up. The Samantha French print above the dresser (she’s one of my favorite painters – here’s her Easy shop) is one we’ve had for years, and we FINALLY got it properly framed! It was actually a birthday gift from John, who sent it off to a framing company called Simply Framed and they made it look so much more legit and lovely with a nice chunky white frame and a perfectly sized mat. This isn’t a sponsored mention or anything (he paid for it, and we love it). 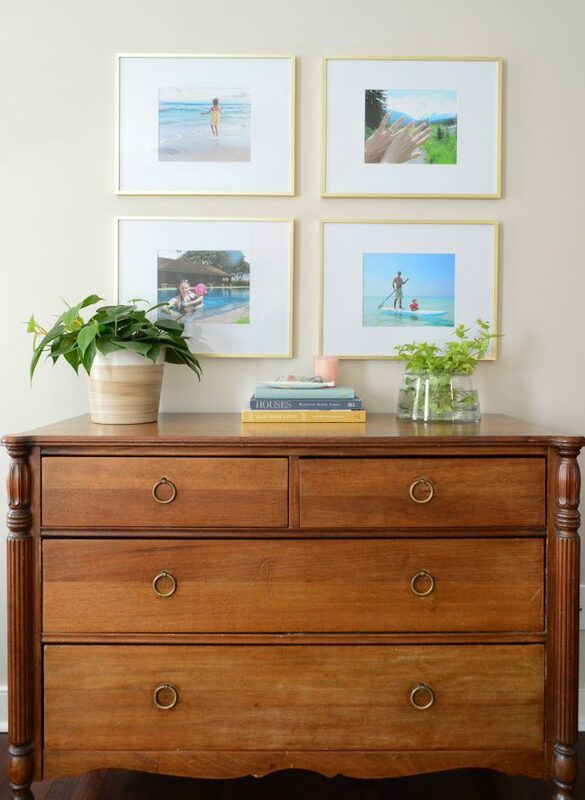 It’s not as cheap as finding a ready-made frame at the store (it was about $120, with a coupon code) but it looks so expensive and well done when it comes back to you. Finally feels like the frame is doing the print justice. It’s hard to tell in the pic, but they even emailed us to say “do you want the mat to go right up to the edge of the print or would you like it to be spaced around a quarter-inch away so the penciled title and signature are visible?” We were so glad they suggested that because that little detail that makes it feel much more professionally done and polished. So that, my friends, is the tale of a bedroom that we thought was going back into dormancy for a few more years, but was propelled into an accidental-but-surprisingly-thrilling makeover, thanks to a rug switch and a whole lot of other free furniture and accessory swapping. 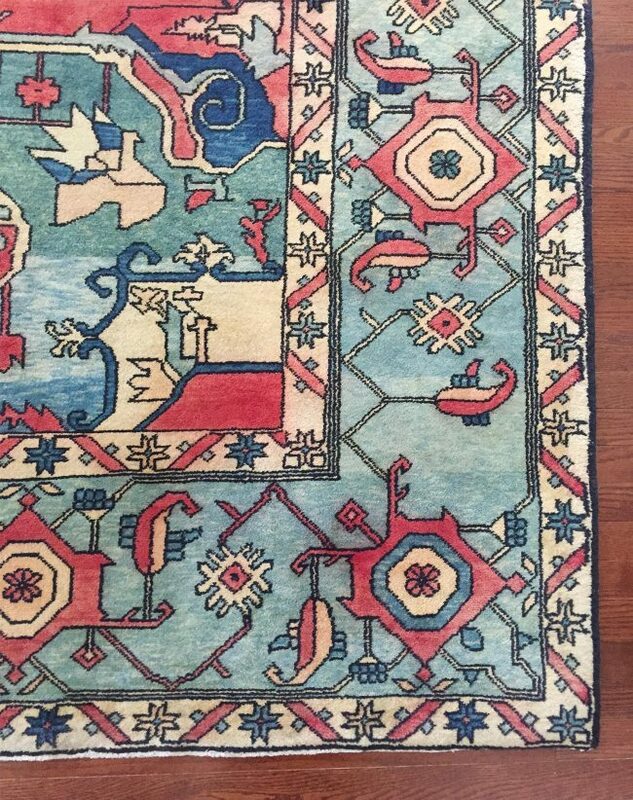 Oh, and that picture above captures one of the cooler things about the rug – see how it looks faded in a few rows? The lady who owns the consignment store said her friend who vends rugs said it’s not truly faded in those areas, it’s a different looming method and type of wool that they use for those parts so the little water-color-like effect is something they intentionally add when they make the rug. Cool, right? I love how layered and soft it looks with those strips of blurrier colors. And yes, I totally daydream about moving those windows over so they’re centered. Except they would look wonky from the front of our balanced brick colonial, so I guess I need to leave them where they are and DEAL WITH THE FACT THAT MY ENTIRE LIFE CAN’T BE SYMMETRICAL. Maybe adding one more curtain panel on that left side and extending the rod would cheat things a little and make it less noticeable? Might give that a try sometime. Update: Due to a bunch of people on social media asking for something similar they can actually buy (since our secondhand rug is one of a kind) I tracked down this rug and this rug and this rug that might give you a similar look. And I’m also obsessed with this one for anyone going for a more-blue-less-pink/red color scheme. But so ends our new tour of the bedroom. I’ll leave you with this performance art piece by Burger, entitled Dog Leaves Bed. You can also always find our room’s paint colors and sources for everything in them right here.